Here’s another way that can help you improve your English. You can practice describing people, things or places in English. Pick something simple like a “table”. 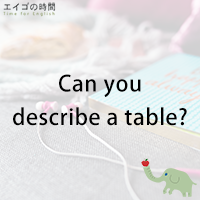 Can you describe a table in English? Can you explain what a table is to someone who doesn’t know what a table is. Having trouble? Well, an English-English dictionary can help you. For example, my Merriam-Webster Dictionary says a table is “a piece of furniture that has a flat top and one or more legs”. Does this make sense to you? If example sentences are given along with the definition, make sure to read them so that you know exactly what the word means and how it’s used in what context. Try this practice every day. Pick one word a day. Remember? Practice makes perfect. In the meantime, I’ll give you a quiz. I’ll read three sentences. Please listen carefully and choose the one that is TRUE. Ready? 1. I’m discussing how to choose a good dictionary. 2. I’m trying to describe a piece of furniture that has a flat top and one or more legs. 3. I’m suggesting one way that can help you improve your English.